A Minnesota Family Resort Vacation -- the tradition of going "Up North" to a cozy cabin on a scenic lake in the Northwoods, relaxing and enjoying time with family and new friends, and making memories that will last a lifetime -- this is what a resort vacation at Eagle Nest Lodge is all about. Come visit us in Northern Minnesota! "Thanks for another great week. We couldn't ask for a better place to vacation or better people to be around! See you next year." We offer 14 exceptionally clean and comfortable housekeeping cabins from 1 bedroom that sleeps 4, up to 5 bedrooms that can sleep 19 people. Our 600’ natural sand beach is raked and manicured daily so you can relax in the beach chairs and loungers, soaking up the sunshine while the kids and the rest of the family play in the sand and water. When you’re done at the beach, make sure you stop by The Lodge for a snack or to pick out a couple souvenirs of your trip. Challenge a family member or new-found friend to a game of pool or ping pong while your there. Our swimming area has all the toys including water mat, bongo rafts, kayaks, hydrobikes, paddle boards, canoes and a hobie cat sailboat. Cutfoot Sioux and Lake Winnibigoshish comprise Minnesota’s fifth largest lake, with more than 72,000 acres of water and less than one percent of the shoreline developed. We are located in the Chippewa National Forest, and the wildlife and scenery here are breathtaking. The fishing here is world-class. Lake Winnie and Cutfoot Sioux are well-known as the best walleye fishing lakes in Minnesota. 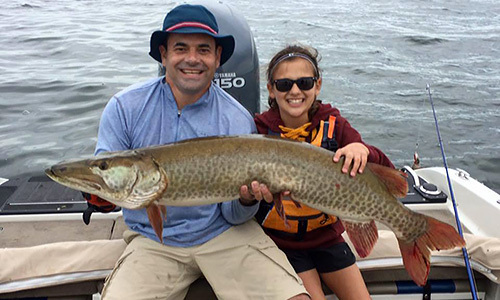 The state record Muskellunge was caught on Lake Winnie and jumbo perch, crappies and panfish are plentiful. Our dock boys are “johnny-on-the-spot” to help you launch and return to our docks. Tell them what you need and they’ll do their best to make it happen – and quickly. Of course our boat slips and docks are well bumpered with ropes and electricity readily available. During the summer, our Activities & Naturalist Program provides planned and supervised recreational opportunities for both the young and young-at-heart. From treasure hunts, trail hikes, crafts and ice cream socials, to volleyball and Bingo, you are sure to have a blast. The hands-down favorite, of course, is our Epic Waterslide down the resort hill into the lake. The slideshow image at the top of this page shows why it’s our guests’ favorite activity. Come to Eagle Nest Lodge to experience Minnesota’s northwoods all year long. Our extraordinary view is a healthy stress reliever spring, summer, fall and winter. Whether you are after the spring walleye migration, the summer sun and fun, the fabulous fall fishing or a bit of cross-country skiing or ice fishing, the friendly staff at Eagle Nest Lodge will take care of you. Are you looking for a Minnesota family resort for an upcoming family reunion, wedding or group retreat? Our variety of cabin layouts and range of activities will meet the needs of all ages. Check out our 5 bedroom reunion cabin for groups up to 19 people. If you’re looking for the best family resort in Minnesota, look no further than Eagle Nest Lodge. Give us a call today at 218-246-8701 to reserve your lake cabin for your Minnesota Family Vacation. Eagle Nest Lodge is the perfect Minnesota Vacation Resort! Your family will love all our amenities for summer fun. Enjoy our wide sandy beach, great swimming area with water toys, scheduled activities, naturalist program, watercraft rentals and world-class fishing for walleye, muskies, northern and panfish on Lake Winnie and Cut Foot Sioux Lake. Follow up a busy day of summer fun with relaxation in our impeccably clean and comfortable lakeside cabins.